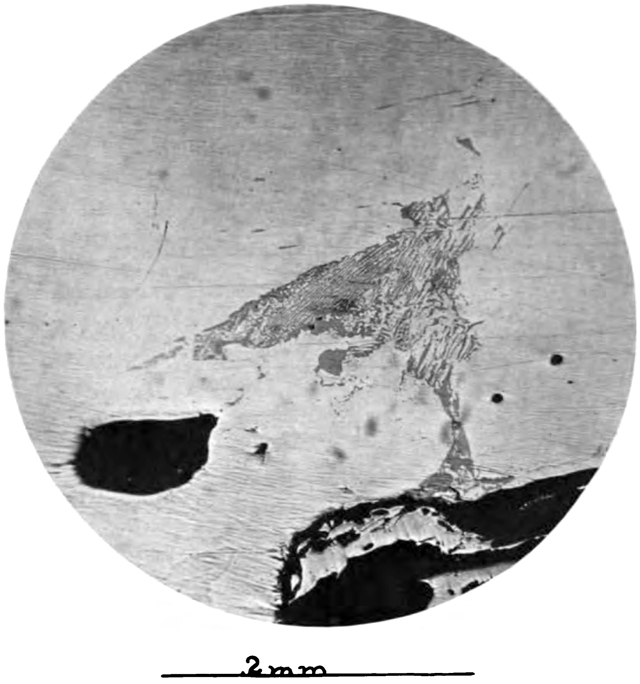 Photomicrograph of a polished section of ore from Cornfield Prospect No. 1, showing graphic intergrowth of chalcocite and bornite. This intergrowth is believed from general relations to be of hypogenic origin, but there is no way of proving that such is the case. If of supergene origin it offers strong evidence that in this case the alteration has been from chalcocite to bornite, it being noted that the bornite occurs in what appears to be a fracture in the chalcocite. This section is another good bit of testimony that the evidence afforded by graphic intergrowths as to the origin of the components is, to say the least, ambiguous. Intersecting lines = scratches made in polishing. Yet another striking image, as if a satellite view of a low-lying coastal area. It is accompanied here (in the caption) and throughout by elaborate and careful sentences — economical prose, but perhaps not as clipped or tight as obtains today.